Sacred Heart's Boy Scout Troop is a very active and enthusiastic group of boys while working on their badges and enjoying campouts and several trips. Each month one major activity is planned. This past year these Scouts have enjoyed several campouts including both a backpacking and canoe trip, and an overnight winter campout. Day trips to a climbing wall and a skiing trip proved to be a success. Past events included a visit to the former Main High Adventure Base for whitewater canoeing, the Florida Sea Base, and the Northern Tier High Adventure Base as well as the National Jamboree and the National Order of the Arrow Conference. As anyone can see this troop is active and "marching on". The meetings are on Tuesday night primarily during the school year from 6:30 to 8:00 pm in Dostie Hall at Sacred Heart Church. 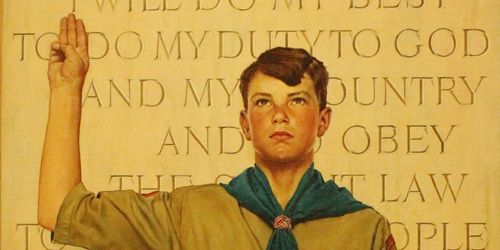 Anyone interested in joining our Troop 23, please call Frank Reff at (315)779-9145.